Continuum specializes in the custom design and installation of Solar Hot Water systems in both Residential and Commercial applications, including radiant floor heating and pool heating. Solar hot water systems are an excellent, cost efficient way to supplement your hot water supply. You can also sell the SREC’s – which can mean up to $600 a year in your pocket. For the typical residential site, we install Closed-Loop Pressurized Glycol and Closed-Loop Drainback systems. We also install solar pool heating systems. There is no trade-off in owning a solar thermal energy system. It can either supplement or altogether replace your existing hot water heater and in both cases you will always have as much or even more capability to heat water than you had before installing a system. Prices start at about $$10k for the average home and they can pay for themselves in about 5 years. In addition, the building value increases by the cost of the system on the day it’s installed. The financial assistance is at it’s best right now. The federal, state, local, SREC, and net metering benefits are all in place and there has never been a better time to go solar. After assessing your site, we will produce a cost-effective solution that reduces the amount of gas, oil and electricity required to heat the water in your home or business by 80% on average. A typical residential system consists of just two 4×8 or 4×10 collector “panels” on the roof, with piping going to a solar storage tank in the current water heater room. Installations take just a day or two to complete. For centuries people have been harnessing the sun’s energy to heat water. To put it simply, think about a garden hose left in the sun…the water inside gets hot. Now imagine that same water being pumped slowly through a special tank that collects the heat and stores it for bathing, washing your clothes and heating your home. That’s solar thermal! Water heated for free, by the sun, used for your needs. Although we offer various models and manufacturers of collectors, we use AET for many of our installations. AET is a reliable, experienced manufacturer that produces quality product at excellent prices.We typically install active, indirect solar hot water systems. 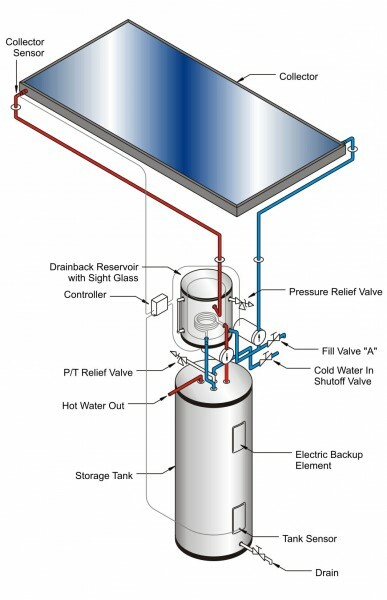 Active solar water heaters use pumps to circulate water or a glycol solution through heat-absorbing collector boxes. 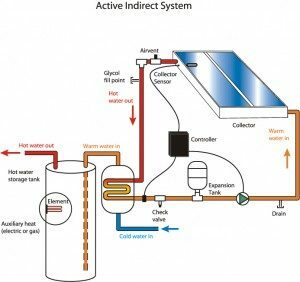 In an indirect system, they glycol solution is pumped through the solar heat collector. This warm solution is then used to heat the water used by building occupants. In this case, your water is indirectly heated. These systems are also known as “closed loop” systems. 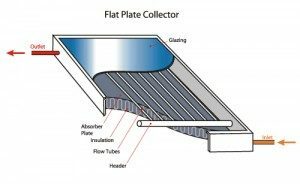 In these systems, a simple pump moves the glycol solution through a loop into the solar collector, through the collector’s pipes, and out of the solar collector. From there, the glycol solution flows into a heat-transfer unit where it warms the cool water heading into a conventional hot water tank. The glycol solution then returns to the pump and again flows into the solar collector without ever mixing with the building’s water. Indirect systems are encouraged in climates with extended periods of below-freezing temperatures, and make up a majority of our installations. Differential thermostats, pumps, sensors, and controls are used so the systems work effectively and safely. 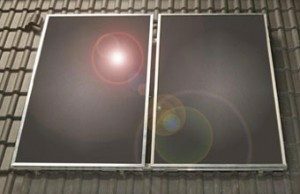 Solar thermal technology is mature and proven with few maintenance requirements from the installed systems. Solar pool heating systems use a similar design, but sometimes glazing is removed to save money and to prevent the pool water from becoming super-heated. Some non-glazed systems look like flat black mats. Inside the mats is a network of headers through which the water slowly passes. More advanced systems like evacuated tube collectors and parabolic trough collectors can heat water or other fluids to much higher temperatures appropriate for industrial needs.